ALLEN PARK, Mich. (AP) If there was an easy way for the Detroit Lions to solve their issues near the goal line, they probably would have done it by now. Instead, those problems have the Lions falling behind in the playoff race. 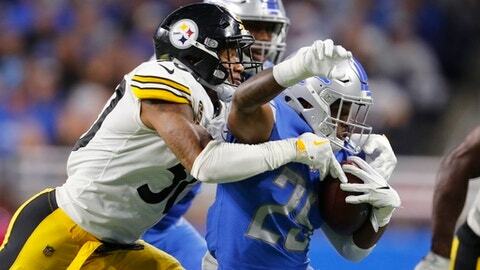 Despite three second-half opportunities inside the Pittsburgh 10-yard line, Detroit was held without a touchdown in a 20-15 loss Sunday night. It was the second time this season the Lions lost in large part because of their inability to reach the end zone from in close, and whether the play-calling or the execution is more to blame, Detroit now has some real missed opportunities to look back on. The Lions (3-4) have lost three in a row, and Sunday’s game was certainly there for the taking. Detroit finished with 482 yards of offense but no touchdowns. In September, the Lions lost to Atlanta when Golden Tate was ruled down just short of what could have been a game-winning touchdown. Down 30-26, the Lions had first-and-goal at the 1. Stafford threw incomplete twice before his completion to Tate was ruled short of the end zone after a review, ending the game . That sequence illustrated the perils of passing out of the shotgun at the goal line – it’s sometimes difficult because the defense has limited space to cover. But the clock was a factor and the Lions were out of timeouts, limiting their options a bit. Against the Steelers, Detroit tried running the ball near the goal line, but that didn’t work either. The Lions’ running game is ranked near the bottom of the league. ”We have to have a respectable running game, make teams honor it,” Caldwell said. The Lions had first-and-goal from the 4 in the third quarter, with the Steelers up 13-12. A run by Dwayne Washington reached the 1, then Stafford threw incomplete and Washington was stopped on another run. Detroit went for it on fourth down from the 1 and had a pass called from the shotgun, but Stafford tried to run the ball in after seeing how many Pittsburgh players were back in coverage. He was stopped. On their next possession, the Lions again had first-and-goal from the 4. After an incompletion, Detroit tried a couple running plays with Washington but didn’t score. The Lions finally settled for a field goal. Late in the fourth quarter, Detroit was back inside the 10, but on that drive, the Lions never got closer than the 6 before turning the ball over on downs. NOTES: DT A’Shawn Robinson was ejected following a skirmish at the end of the game while the Steelers were kneeling out the clock. ”When you’re wrong, you’re wrong. Obviously, he was penalized, ejected from the game, so that’s an issue,” Caldwell said. ”There’s three guys that ran out onto the field, that’s an issue. So, those are the things we got to address. We’re not going to stand for it. … We want to play this game the way it’s supposed to be played and losing your poise is not one of those things. So, we’ll handle that. We’ll handle it in house and certainly the league may have something to say about it as well.” … P Sam Martin played for the first time this season after being on the non-football injury list. He did not specify how he got hurt. ”I wasn’t doing anything stupid,” Martin said. ”It’s a freak accident. It’s not even worth the story.” … The Lions put G Tim Lelito (thigh) on injured reserve and signed DE Jacquies Smith.